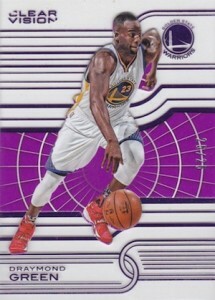 Carrying over from football, the acetate-driven 2015-16 Panini Clear Vision Basketball offers collectors a new option for top NBA players. Centered more on the design, autographs are available, but quite rare. 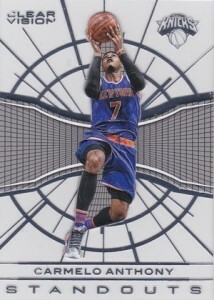 The base set consists of 141 cards with over 30 rookie options, including Kristaps Prozingis and Karl-Anthony Towns. Short print Variations showcase a different image for key rookies, averaging 1:28 packs (1:7 boxes). 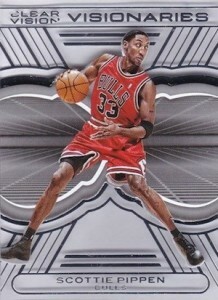 Parallels limited to 149 or less include Bronze, which is a case hit. 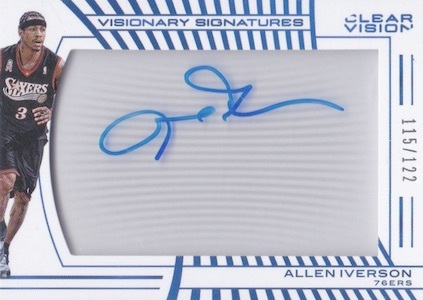 Averaging one per inner case (8 boxes), signed options include Clear Vision Signatures and Visionary Signatures. 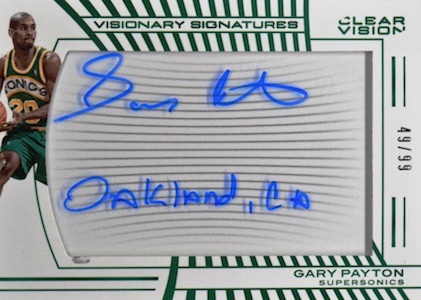 Highlighting current players, the Clear Vision Signatures also add a Gold parallel (#/25) while the Visionary Signatures inserts showcase 20 former greats and can be found with a limited Inscription parallel. 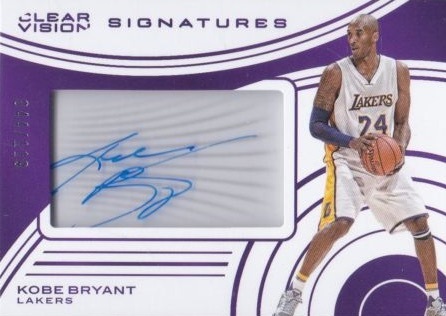 In addition, collectors will find one standard insert per box from choices such as Visionaries and Standouts. 2015-16 Panini Clear Vision Clyde Drexler Visionary Signatures Autograph Auto! The 5th mock-up image in the top row, I’m pretty sure that’s Magic Johnson’s signature on Shaq’s card. Chris Gonsalves � You are correct. Panini occasionally makes mistakes with their mock-up images. I’m excited about this product. Upper Deck’s ex2001 is probably my favorite set from the 90s and I’ve had a soft spot for acetate ever since. These boxes might not have any value now, but the rookies later on will give you good value for these cards. This is a great option! Panini has offically dropped the ball on this one. Retail is $70 a box and you are only guaranteed 1 hit every 8 boxes. Most collector’s are looking for relics and autographs. 1 hit per box shouldn’t bee too much to ask for 70 bucks. Am i supposed to be excited because the base cards are clear. Yes they are nice but they are just that base cards with little to no value! Product is trash! Yet another Panini flop. Luckily these guys have little to no competition, otherwise not sure they would stay in business here in the USA. Perhaps their international / European business offers more value for money to collectors there? For set collectors this is a fun one. If you can find the boxes cheap enough (under $35) it’s well worth putting together. The SP’s and variations aren’t impossible to hit, and the RC’s could be really attractive down the line. For the reasons mentioned above you may be able to get these for really cheap unless one of the rookies blows up.